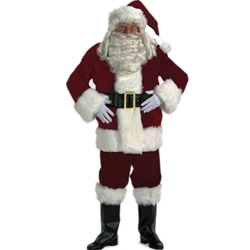 High quality velvet Santa suit made of burgundy colored velvet and accented with luxurious white long hair plush trim. This Santa Suit gives you the perfect costume for dressing up as Santa for all of your Christmas needs including company parties and surprising kids. The only thing you need to complete the look are wireframe glasses and a Santa wig and beard set! Costume is available in size standard or extra large.